• 2064 square feet , Plus 672 square .feet. attached garage + 3 bath , 3 bedroom “Bi-Level FOR SALE USD $ 274,999 . Location! Welcome to Crown Point, IN and the desirable Winfield Township. This property has reasonable property taxes (less than $100 per month 2016 year which is payable in 2017) . The Home’s location is close to I-65 for ease of commute to Chicago-land. CUSTOM Built Bi-level Home for sale-original owners. Open Concept Design w/Cathedral Ceilings in Entry Foyer, and Formal Living Room and Formal Dining Room and Kitchen and Master Bedroom. Gleaming Oak Hardwood Floors In LR that extend into FDR that’s open to Beautiful Kitchen with an abundance of Maple Wood Cabinets (appliance garage). Extensive use of ONYX tile accents, lovely GRANITE counters plus breakfast bar with 2 stools, PORCELAIN tile floor and NEW Stainless Appliances plus stainless double sink! Doors to Big NEWER Deck extends dining options seasonally. 3 Nice size BR’s with BIG Windows (Master has it’s own private bath). All Bathrooms and lower level Laundry have custom granite vanities/sink. Spacious Recreation room in the lower level with an adjacent second dining area which could be converted to a future 4th Bedroom depending on the new owners needs as it has adjacent 3/4 bath. WALKOUT sliding doors to LL PATIO and a 6 to 8 Person JACUZZI Stays! Well Kept home recently painted in Neutral Tones. Nice size backyard too. 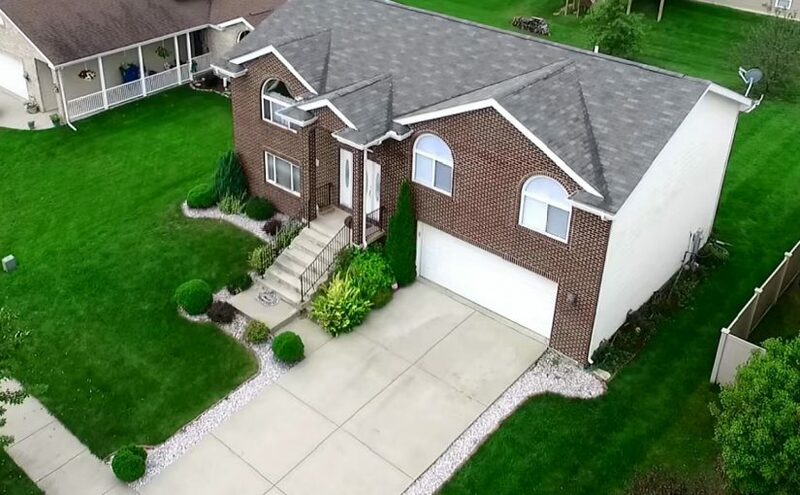 Over 2000 finished SF Home on a 65 x 125 Lot with an over sized Attached garage (another 672 SF) – this home is worth your careful consideration. Some of the furnishings are available for sale also = call 219-309-9930 for details! Showings by appointment with day before notice please call 219-309-9930.